Dig that crazy sculpture down at the bottom left. I got in to my hotel SUPER early and they had exactly one room to give to me. Fortunately, one room was all I needed. Tonight: Los Angeles! Downtown! The Last Bookstore! 7pm! Be there and bring everyone you know. It’s easily reachable through public transportation! Right by the Pershing Square stop! Tomorrow: San Francisco, and the event is at Borderlands Books, one of my favorite bookstores in the country. Come on down and see me! I think you mean bottom-left. The crazy sculpture in the bottom-right is a tree. Cement jungle with some junk artifact that looks like a laundry dryer dressed up with some metal scraps. Enjoy your stay. Come on man, he’s there to SELL a book, not to exchange. I grew up in LA in the 80’s and even though I know things are different now it’s still pretty jarring to see “Los Angeles” and “easily reachable by public transportation” in the same context. Those things don’t mix in my mind. 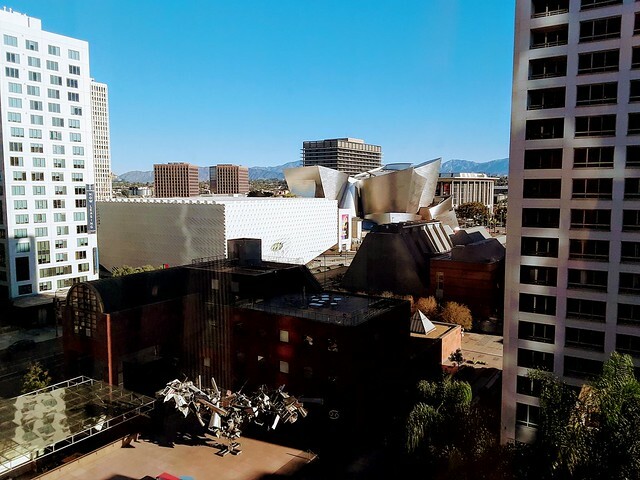 You might go take a look around the crazy silver sculpture in the upper-right, also known as Walt Disney Concert Hall. It’s a fantastic structure that you can sort of climb around and it’s an amazing concert hall. Hey, you’re a mile from my apartment! That’s not a sculpture. It’s a Transformer resting between takes. Do you have time to get your Pixel 3, or are you stuck with TempPhone until you get home? Enjoying the book so far! Btw, the concert hall skin is stainless steel. If you want a free tour hit me up. At a glance, I thought it was a transformer! I thought, I knew they were real! Does a resting transformer count as a car park? What you might want to do in future, as regards the left/right thing, is hold your hands up in front of yo face, yes?, and do like pointers with your fingers, comme ca: L and … well, backwards L. _| (aha!) The hand with the shape most resembling a capital “L” is the left side. Right? Or left. Right. Oh, FML. That is a wonderful view of the city I love. My first reaction was Wow, look there’s Disney Hall! and how lucky that he got to see that sculpture. Hope the meetings went well. Have fun on the rest of the tour. Both versions of the book arrived, but I am a fast reader, so I’m putting off starting it because I already don’t want it to end. I am going to read the Collapsing Empire again before the new one to stretch it out. Found and bought The Consuming Fire today at the local Waterstones bookstore. It’s straight to paperback in the UK.